How did the hashish come to the Land of Israel, how did the local residents smoke in those days, and what was the name of the Bedouins for the Farsh that mixed with hashish? Historian Yuval Malchi talks about the cannabis scene that flourished in Zion under Ottoman rule. If you ask Yuval Malchi, He will define himself as a "public historian": "This is a relatively new field," he says. "Historians usually deal with specific studies, university professors ... I work with very broad audiences." Malachi, who has a master's degree in history and international relations from Syracuse University in New York, has certainly managed to reach "very wide audiences" in recent years. In addition to lectures on the history and technology he provides in various organizations, Malchi participates in many television and radio programs, in which he shares with viewers and listeners fascinating historical anecdotes. 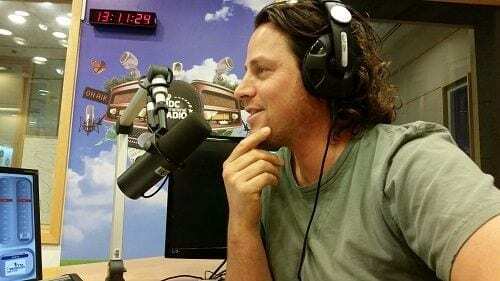 His famous podcast "Excerpts in History" (in which you can find chapters such as "Coffee, hashish and pirates") Is considered one of the first podcasts published in Hebrew and the most balanced on the portal Israeli Internet broadcasts" iCast ". In a conversation with the magazine's reporter, Malachi talked about the customs and trade practices of cannabis and hashish in Ottoman Palestine, in the years 1516-1917. 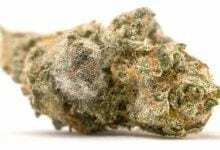 "Almost all the stories dealing with hashish talk about the 'plague of drugs,' which is pretty funny because cannabis was very popular in the Land of Israel until recently," Malchi says. "Just as Europeans drink alcohol, here the Muslims can not, so they found other ways." 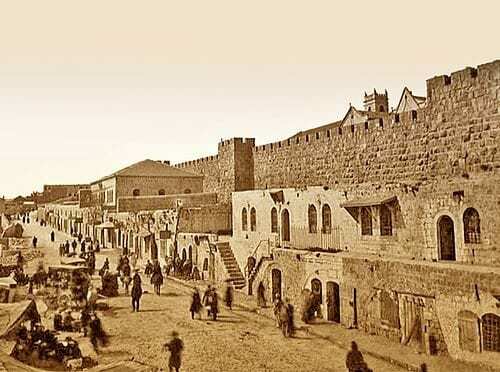 Malachi says that during the first years of the Ottoman conquest, the Land of Israel was blessed with prosperity and new customs: "After the conquest of the land by the Ottomans, there was a wonderful period here for several decades. The money flowed, Jerusalem underwent renovations, all sorts of people came to Israel from abroad and new customs were brought with them. " "It soon became customary to drink coffee. People were enthusiastic about the new drink and within a short time many Muslims went to sit and meet in cafes that opened in Israel instead of mosques. The clerics, mainly Muslim but also Jewish, tried to issue orders to shut down the cafes. At first they succeeded but it did not take long until the cafes overcame the mosque and they popped up everywhere. People used to drink 2-3 cups of coffee a day. 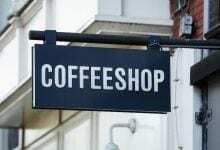 Cafes were soon built near water sources, and vines were planted in the place, which saved the drinkers. " Malachi continues to describe the changes in leisure culture in the Land of Israel of those days: "The cafes were the answer to the Middle Eastern pubs of Europe. They came from all religions, musicians who were hired by the proprietor of the coffee shop, and the culture of coffee continued to develop. Soon the coffee culture was accompanied by another action, smoking. 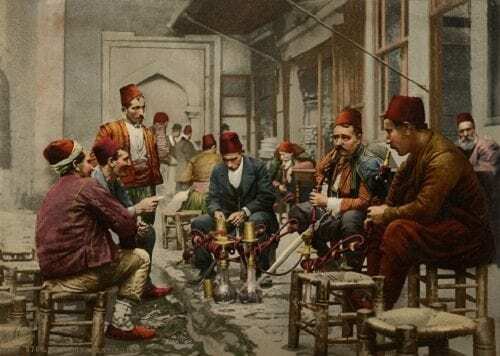 The cafes held hookahs and it was customary to smoke before drinking coffee. The servant brought a hookah without being asked and passengers testified that there are always hookahs ready for use in the cafes. " "Women used to smoke too," he says. "Especially among the Bedouin. Many of them, although they knew there was damage to smoking, were unable to quit. Soon the tobacco was given an Italian name, Deal Demonio, 'grass of the breast'. 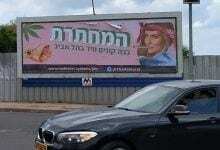 Jews used to ask many halachic questions related to tobacco at that time, they could smell it on Shabbat, in the sitting room, what about tobacco induced by the wine of gentiles, etc. " "Pilgrims who arrived in Israel testified that anyone traveling on the road must have coffee-drinking equipment and a smoking kit. Tobacco smoking plus hashish has become part of the cafe's social life. In those days they used to add the hashish to coffee or smoked it through a hookah. The name Hookah comes from the Sanskrit Narayan Narkhila, which means coconut. " A few more salts about travelers who arrived in Israel at the time said that "Easterners spend days on end sitting east without moving almost at all and soon hashish became a source of pleasure for them to smoke the evening after work day, but you could find people smoking also During the day, as you could find drunks in the streets of Europe. " 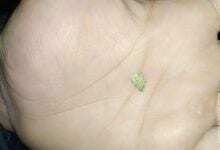 Much of the hashish in the Land of Israel of those days came from the nearby Arab countries, but according to Melchi, in Israel itself there were quite a few cannabis growers. 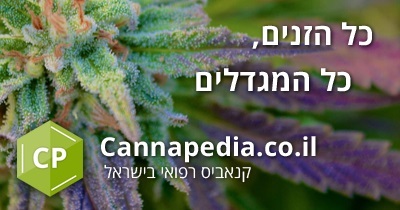 "Travelers who visited the country in the 18 century said that the cannabis plant is grown in many places, including in Jaffa where an anesthetic reminiscent of opium is prepared." Malachi continues to describe the common "hashish parties" of Jews and Arabs that took place in Israel at the time, until the British conquered the area. 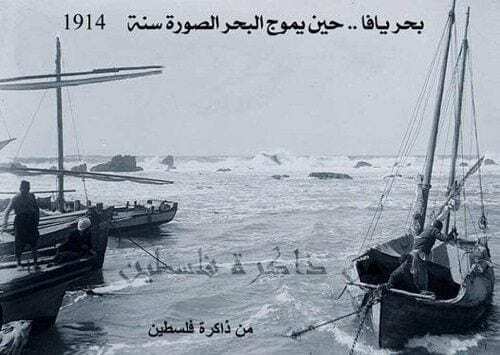 They removed the hashish from the law and destroyed the celebration: "We find references to social causes, They used to consume hashish as part of the social life. Jews and Arabs participated in these parties until the end of the First World War. After the British conquered Palestine and expelled the Turks from the Middle East, they began to impose prohibitions on the growth and consumption of the cannabis plant. " "In the 30 of the last century, Jews who moved to Tel Aviv still used to go to Jaffa to spend time in Arab cafes and smoke pot," he says. "But after the occupation of the West Bank, Judea and Samaria, the hashish that was common among Arabs began to flow into Israel, and the smoking of cannabis became common again." "Then my lecturer lit a joint"
Finally, as an expert on history and the background of the cannabis issue, we asked to hear Malachi's opinion on the so-called 'war on drugs': "I think the whole issue is very foolish," he said. "I'll tell you a personal story. At age 14 my family went down to the United States. I went to high school and kept talking about drugs, hashish, heroin, hallucinogenic mushrooms. They did not separate them. For a few good years I have been brainwashed that any drug is almost as dangerous, can cause psychiatric delusions and so forth. I did not touch, or rather I dared not touch and anyone who touched me was wrong. " "When I got to university, we sat with a professor of philosophy one day, and during a conversation he took out a joint, smoked and passed it on. I was shocked. The next day, together with another friend, we went to the library and a whole day we read about the subject, what does it do, what research studies say about marijuana, and we were shocked that all the studies almost did not tell the same story we heard at school. We were confused and after a while, almost like everyone else, we started smoking. " "In the United States, the smoking culture of marijuana is very common and in the university almost everyone smokes. Not only that, they also grow forests in some of the fraternities. I can tell you that a personal alcohol experience has brought a lot of people to violent outbursts, there have almost always been blows around the bars. With marijuana it was completely the opposite, people were calm, smiling, laughing, violence was the farthest thing from them. If it was legal in the country, there would be many more happy and calm people than today. " According to the historian, there is a need to educate the youth about the dangers inherent in the consumption of various drugs, without falling into fear and unnecessary slander: "It is funny how many billions were spent in the United States on the 'war on drugs' without separation. There are dangerous and dangerous drugs like heroin and there is the cannabis plant. These are two very different things from each other. Cannabis is closer to caffeine and probably less dangerous or harmful to alcohol. The world has begun to understand this in recent years. It is no wonder that alcohol and drug companies are the biggest opposition in the United States to legalization. They are very afraid of a natural competitor that anyone can raise at home. "